When I was a kid I had a couple friends who had a cow lick. I knew a girl and a couple of boys too. The explanation for it made little sense to me, a suburban kid. Named for what the coat of a calf looks like after its momma licks it. That giant cow tongue apparently leaves quite a mark. 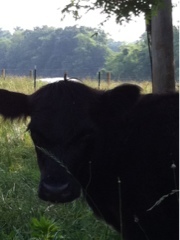 And we have a black angus with a cow lick here on the farm. With an impressive cow lick right on the top of its head. 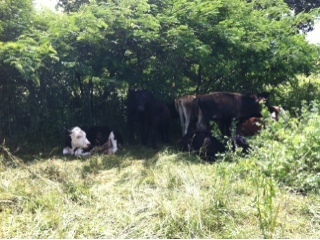 During the heat of the day the herd vies for shade. Temperatures have been lovely, with hot sun during midday. We think that at night the herd still pushes each other around for good spots. They sure do it all day long.